My story unfolds in two locales. The first on the brightly lit fantail of a ship at sea in the impenetrable darkness of the ocean at night. The second in a dimly lit cubicle amid an incomprehensible tangle of instruments and electrical wires inside a mammoth facility called a synchrotron. The ship pitches and rolls. I can hear the waves dash against the ship and feel the spray in my face. But with a thick layer of clouds blocking any moonlight, the world around me remains invisible and infinite. From horizon to horizon, water surrounds us. I feel a little disoriented, but also single-mindedly devoted to the task at hand: Somewhere in this vast expanse lie the samples of sediments, minerals, and microbes that I hope to collect. The minerals I’m looking for—manganese oxides—are ubiquitous but mysterious. They are found in seafloor sediments, coating stalagmites in caves, and in your standard shovelful of soil, and they possess useful chemical properties. They are rich in nickel, copper, and other rare earth elements that wind up in our electronics and touch screens. They are used to remove contaminants from drainage waters and are being investigated as possible catalysts that split water to produce hydrogen fuel. But we still don’t understand how and why manganese oxide deposits form in the environment. In the laboratory, we know that if we combine the right blend of reagents, we can precipitate several different forms of manganese oxide minerals. But somehow these lab-synthesized minerals never look or behave the way natural manganese oxides do. We have one lead: In natural manganese oxides, organic and inorganic molecules are melded in novel ways. What causes these inorganic and organic molecules to combine? And do these manganese oxides, combined in this singular way, have different chemical behaviors and properties? We hypothesize that microbes facilitate mineral synthesis, a process known as biomineralization. I am looking for evidence that microbes contribute to mineral formation in the seawater and sediment samples I collect. In particular, I am investigating the role played by a manganese-oxidizing bacteria named Roseobacter sp. AzwK-3b, or Azzie as we affectionately call it. So, I find myself shipboard in the North Atlantic, gazing into the black, and hoping that my samples materialize with the dawn. Weeks later, I find myself bleary-eyed and unsure if it is night or day, nestled in the recesses of the Stanford Synchrotron Radiation Lightsource, where I eventually bring my samples for analysis. The synchrotron facility sits inconspicuously tucked into the bottom of a hill, an amalgam of numbered buildings with 1970s pre-fab style architecture connected by corrugated metal walls. From the outside, it looks more drab than intriguing. But inside, the building pulses with life. Electrons diverted from the nearby linear accelerator enter the synchrotron’s 767-foot-circumference ring. A magnet bends them around and around the loop so that they emit pulses of X-ray energy. My samples absorb the X-ray energy, providing data to analyze their chemical composition and structure. Operating 24 hours a day, the facility’s white noise and harsh lighting only increase the sensation of being in a world apart. In it, I have the same insular but wondrous sensation I have working on a ship in the open ocean. 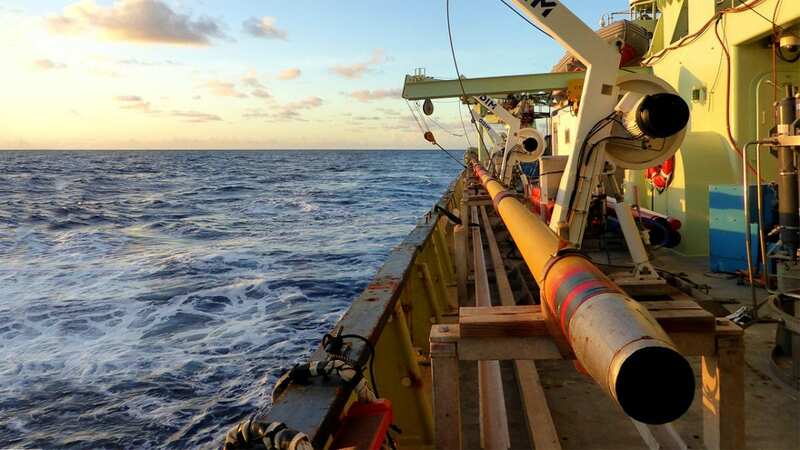 There’s beauty in the “different-ness” and in the functioning immensity of these two worlds—the ocean and the synchrotron. And there’s a beauty in feeling like a small but purposeful part of these habitats as I go about my research. Certain biominerals such as nacre, or mother-of-pearl, have been well studied because they possess properties useful to humans. Nacre lines the interior of mollusk shells, giving them their iridescent hue. It consists of alternating layers of organic carbon polymers and calcium carbonate minerals. The combination of organic and inorganic components makes for a strong, resilient mineral. By understanding and then mimicking the way the mollusk designs and controls mineral growth, scientists may be able to develop new biominerals. Nacre is an example of a mineral whose precipitation is “biologically controlled.” That means the organism actively directs mineral formation through the use of highly specific organic carbon molecules. Less well-studied is a class of biominerals whose precipitation is “biologically induced.” In this scenario, the organism alters the chemistry of the surrounding environment, creating the right conditions for mineral precipitation without micromanaging the mineral’s growth. Mineral formation may even be an inadvertent side effect of a separate process. These accidental minerals don’t necessarily look biological and are therefore hard to identify. And, unbeknownst to the organisms, these mineral byproducts may ultimately be beneficial to them. Manganese oxides are an excellent and important example of this phenomenon of biologically induced precipitation. Once formed, the solid minerals are highly reactive. They can break down large organic carbon molecules into smaller pieces that feed into the microbial food web. Sometimes they convert the organic carbon all the way to carbon dioxide—the oxidized, inorganic form of carbon. Manganese oxide minerals are also incredibly sticky and reactive. Organic molecules, nutrients, as well as toxic metals adhere to their surface and can be eventually incorporated into the mineral as it grows. These properties make manganese oxides valuable for mining, pollution treatment, chemical catalysts, and myriad other applications. So how do microbes help manufacture manganese oxides? To unravel that mystery, I analyze three types of manganese oxides: synthetic manganese oxides I make in a beaker; biotic manganese oxides that I also form in the lab using a pure culture of Azzie bacteria; and, finally, manganese oxides in natural sediment samples from thousands of meters below the sea, collected by Woods Hole Oceanographic Institution’s long coring device. By comparing the minerals formed under these three different conditions, I hope to determine exactly how bacteria contribute to the oxidation of manganese and precipitation of manganese oxide minerals. The oxidation of metals is a chemical process you see all the time. Iron, the element sitting immediately adjacent to manganese in the Periodic Table, undergoes a nearly identical reaction to produce rust, often to our dismay. The key difference between iron and manganese, however, is that while iron will react spontaneously with oxygen to form a coating of rust on your car or your pipes, manganese requires some cajoling in order to oxidize and precipitate as a mineral. To form iron oxide, or rust, iron needs to lose one electron. Manganese needs to lose two, and under most natural conditions, there are energy barriers to manganese reacting directly with molecular oxygen in seawater. In the ocean and most other environments, manganese is present in seawater as a dissolved phase, Mn2+. To form manganese oxide minerals, manganese atoms need to give away two more electrons, oxidizing to Mn4+. In the process of oxidation, the manganese atoms grab a few oxygens, either from seawater molecules (H2O) or oxygen gas (O2) from air dissolved in seawater, and transform into a solid mineral. Here is the first place microbes play a role. In previous research conducted in my lab, we found that many microbes produce and exude the compound superoxide—a highly reactive form of oxygen. Superoxide forms when your standard O2 molecule receives an additional electron to become O2–. Superoxide is unstable and will react quickly with most molecules or atoms it encounters. In some cases, it will give back the electron it initially received, and in other cases, as with manganese, it will steal a second electron and bond to hydrogen atoms to become hydrogen peroxide (H2O2). This process oxidizes Mn2+ to Mn3+. Like superoxide, Mn3+ is unstable and either wants to revert to Mn2+ or donate a second electron to become Mn4+. In most circumstances, Mn3+ reverts to Mn2+ because the reaction to form Mn4+ occurs more slowly. In natural systems, however, we hypothesize that manganese-oxidizing microbes help Mn3+ take the other route. The microbes not only produce superoxide, which helps form Mn3+, they also produce and exude facilitating organic molecules, called ligands. Mn3+ atoms can bond with ligands until they can donate another electron and become fully oxidized to Mn4+. We hypothesize that there’s a third piece to this puzzle: Biologically induced manganese oxides require an organic carbon template to grow around. Unlike nacre in mollusks, which forms around a specific polypeptide or protein, manganese oxides form around a range of proteins or sugars that may have similar properties. Beyond their role in facilitating electron transfer, the ligands or other organic molecules produced by Azzie may also serve in the crucial role of templates. It’s this final microbe-produced template I hope to discover and characterize at the synchrotron. Researchers in my lab have inferred the existence of this template made by microbes. By comparing the mineralogy and incorporated carbon of abiotic, lab-synthesized manganese oxides with that of biological ones produced by our favorite bacteria, Azzie, we infer that Roseobacter sp. AzwK-3b is responsible for making the template. In our abiotic experiments in the lab, when we blend together the right chemicals, we can produce a type of manganese oxide mineral in which tiny individual mineral particles are too small to see, but they turn the color of the solution from clear to golden beige. The mineral is in a colloidal phase, disordered and less crystalline—almost how window glass is a less crystalline form of the silicon oxide mineral quartz. This abiotic manganese oxide colloid, however, never ripens into a more crystalline form. Microbes are needed to produce and exude compounds that facilitate structural transformation and aggregation. In our biotic lab cultures, Azzie produces superoxide that induces the precipitation of manganese oxide minerals. Azzie also produces the critical organic carbon molecules that first stabilize Mn3+ and later act as a mineral template that catalyzes a “ripening” reaction: Unlike the colloidal abiotic minerals, the biotic manganese oxide particles slowly increase in size, alter their crystal structure and symmetry, and begin to aggregate. They glue themselves together with those organic molecules to form visible brown-black particles. 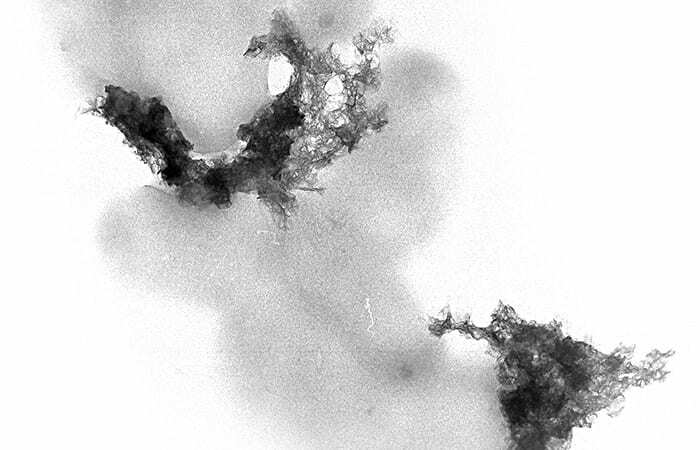 This biogenic carbon template made by microbes may be absolutely necessary to form the manganese oxides typically found in the environment. And by this reasoning, natural manganese oxides may be a signature of life on Earth and elsewhere. The synchrotron facility is where I can closely examine the organic molecules inside and outside the manganese oxide minerals. I use a technique called NEXAFS, an acronym for “Near Edge X-ray Absorption Fine Structure” spectroscopy and pronounced as if it were a word. It works like this: X-rays hit an atom, which absorbs the energy and ejects an electron. Heavier atoms require higher-energy X-rays in order to induce this process. By tuning the incident X-ray energy to a specific value, I can analyze a single element at a time in my sample, usually carbon. 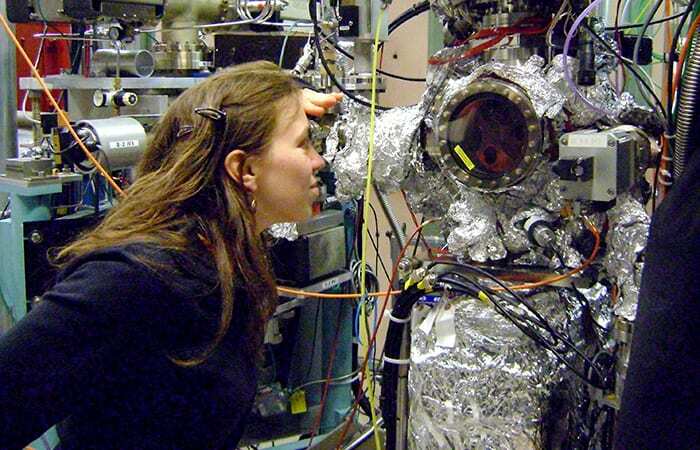 In practice, I scan samples over a range of X-ray energies from just before to just after what’s known as the carbon absorption edge—the minimum energy necessary to eject an electron from the element’s atoms. By scanning over the energies at the absorption edges of carbon, nitrogen, oxygen, and manganese, I can reconstruct which atoms are actually connected to one another and reveal what type of organic carbon molecule acts as a template for the mineral. From that data, I get spectra containing a big peak at the absorption edge and a series of smaller “near edge” peaks. The exact position of these smaller peaks depends on what other atoms surround carbon. If I detect a nitrogen atom, the compound might be a protein molecule. If I detect an oxygen atom, the compound could be a polysaccharide chain of sugar molecules. With that goal in mind, I blink the sleep from my eyes, indulge in another fortifying sip of coffee, and watch the squiggly lines of spectra slowly form on the computer screen. Each sample looks subtly different from the previous one. I stare at the dusty white walls and grimy tile floor. I convince myself I see peaks in the spectra readouts that may not really be there. I think back to the ship in the Atlantic, where the water was impossibly blue and the sky impossibly broad and I was joyously collecting more sediment than I knew what to do with. I convince myself that those peaks are, in fact, present. Back home, armed with a good night’s sleep and some spectral processing software, I am able to draw more realistic conclusions. After my first two trips to the synchrotron, I narrow the list of compounds that could serve as a template down from many to only a few. Maybe on my next trip, I can narrow it down further and identify those same compounds in my natural samples. And maybe, if I’m lucky, I’ll eventually get an answer. Meanwhile, billions of microbes in the sea are synthesizing more of these compounds for me to collect and examine. This research was supported by a National Science Foundation graduate research fellowship and a WHOI Coastal Ocean Institute grant to Emily Estes and an NSF grant to Colleen Hansel. 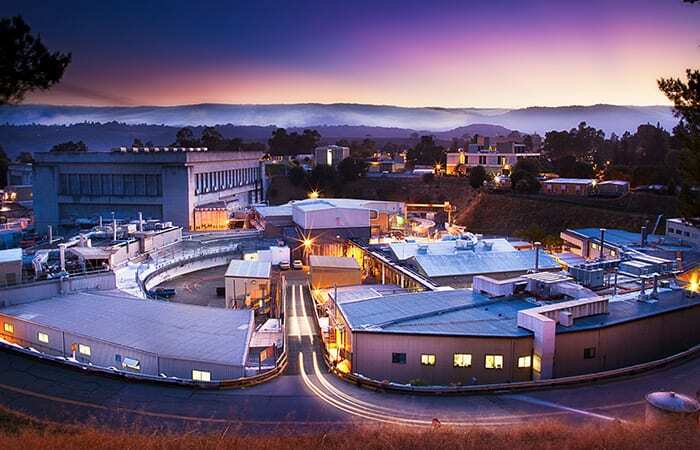 Use of the Stanford Synchrotron Radiation Lightsource, is supported by the U.S. Department of Energy. MIT-WHOI Joint Program graduate student Emily Estes works within the jumble of instruments in the Stanford Synchroton Radiation Lightsource, which she uses to analyze the composition and structure of minerals in her seafloor samples.